When I hear the words “Turkey Meatballs”, I think “Diet!” These are NOT diet! These are yummy yummy and yummy! 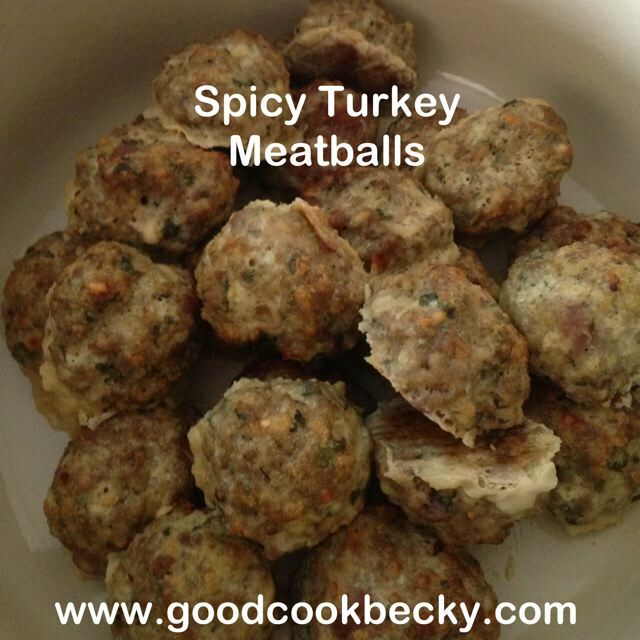 They contain ground turkey, Italian sausage, and prosciutto ham! Red pepper flakes along with Asiago Cheese, gives it a kick of spice. The recipe is from one of my favorite cooks: Ina Garten, also known as the Barefoot Contessa. You can find the original recipe on food network. She recommends Rao’s Spaghetti sauce.. I did find it, but I have to say it is pricey. More pricey than I like to spend on a sauce (10/bottle), so I used a nice Barilla Tomato Sauce with Basil. This makes a lot. I froze about half the meatballs to use again on a day when I don’t feel like cooking (yes that does happen!) I will be making them again! Preheat the oven to 400 F and line 2 sheet pans with parchment paper. Process the bread in a food processor to make breadcrumbs. Add them back into your measuring bowl and add the milk and allow the crumbs to absorb the milk for a few minutes. Meanwhile, in a large mixing bowl, use a fork to combine the turkey, Italian sausage, prosciutto, grated Asiago cheese (I processed it in the food processor after the bread), parsley, oregano, red pepper flakes, salt and pepper. Add the breadcrumbs to the mixture and toss gently with a fork to keep the meat light, without pressing down on the meat mixture. Add the olive oil and eggs and toss gently to combine. Using your hands, form 2 inch balls and place them on the parchment paper lined sheet pans. Brush the meatballs with additional olive oil. Bake at 400 F for 35 minutes or until they are completely cooked through. Add the meatballs to a large sauce pan and cover with your favorite spaghetti sauce. Serve over cooked spaghetti and top each serving with additional grated Asiago or Parmesan cheese. Categories: Ethnic, Ethnic - Italian, Ina Garten, Main Dish, Main Dish - Pork, Main Dish - Turkey | Tags: Ina Garten, Ina Garten recipe, Ina's Spicy Turkey meatballs, Meatballs and Spaghetti, Turkey Meatballs | Permalink. We have had a busy few weeks at our home. Two weekends ago, I had friends visiting from Austria, my son turned 8, and my daughter decided that that weekend would be a cool time to need surgery to have her appendix removed. My husband and I took 12 hour shifts at the hospital to see her through. She came out fine and has even returned to school! This week was much tamer, but I still had friends over because their daughter is about to leave for England to attend College and we won’t see her for a while. I made ribs and chicken. With plenty of chicken left over I wanted to use up a bulk of the leftovers. Chicken A La King is one dish the whole family enjoys. Since you use cooked chicken it does not take very long to prepare and is flavorful. 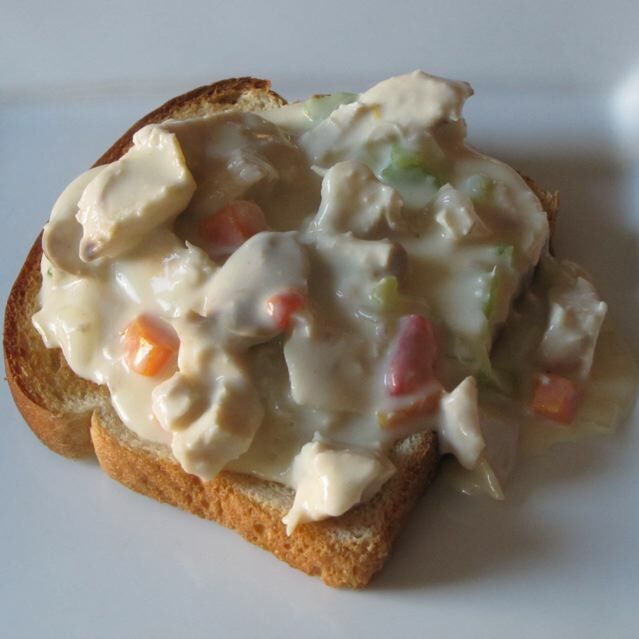 Chicken A La King is chicken in a white gravy served over toasted bread. You can also use the base of this recipe to use up left over turkey. Melt the butter in a large saucepan over medium high heat. Saute the carrots, celery and onion until tender, about 15 minutes. Add the flour and salt and stir constantly until the flour is no longer raw. Reduce the heat to medium and slowly add in the chicken broth whisking it to get the mixture smooth. Add the half and half, stirring constantly until heated through and slightly thickened. Add in the chicken, mushrooms and pimientos and heat through. Taste and season with more salt if desired. Serve over toasted bread. Categories: Main Dish, Main Dish - Chicken, Main Dish - Turkey | Permalink. Turkey burgers – you don’t like them because they are dry and lack flavor. Well, these will change your mind about them. These have wonderful flavor and are moist as well. 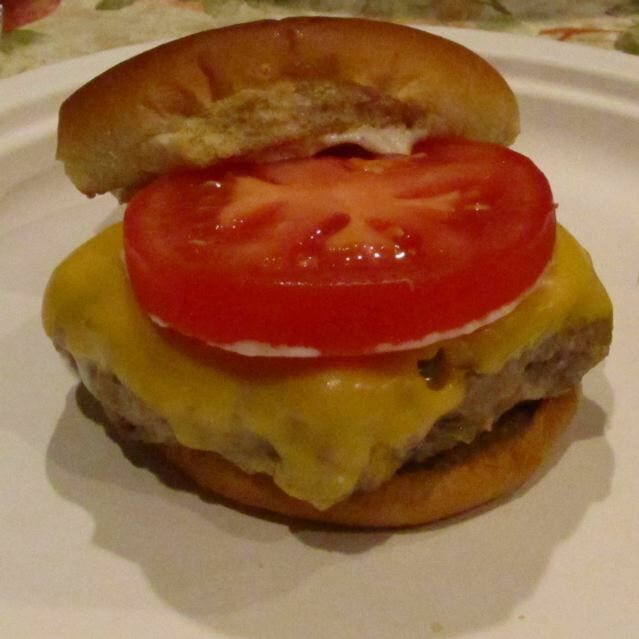 Serve on a bun with sliced tomato and pickle and a smear of mayo. Yum. I had to take my son to kids choir and my husband and two daughters had the four leftover burgers for dinner and they liked them even better the second day. (They were fully cooked the day before and just warmed up in the microwave) These also freeze well. I like to cook my onions, because I do not like the taste of raw onion. I used a sweet Walla Walla Onion this time, but any onion will do the job. Red onions would also be very nice in this burger. I feel the onions add moisture to the burger once they are cooked. The egg you could use egg whites, but I think they hold together better with yolk. Substitute fresh parsley for the dried if you have it on hand. I think basil would also be very nice in this burger. I hope you enjoy. Heat a small skillet over medium high heat and cook the onions in olive oil until they are tender, about 3-5 minutes. Add minced garlic and cook for one more minute. Allow to cool a bit. In the meantime, combine the ground turkey, bread crumbs, parsley, seasonings, and Worcestershire and soy sauce. Add the cooled onion mixture and stir to combine. Beat the two eggs and add to the meat mixture. Stir to combine everything together. Heat a cast iron skillet over medium-high heat. Add 1 tsp olive oil. Shape the meat into 10-12 patties. Cook over medium high heat for about 5 minutes each side, or until they are no longer pink in the center. Top with cheese if desired, but they are quite delicious just with mayonnaise and tomatoes. I served them on toasted burger buns. Categories: Ethnic - American, Main Dish, Main Dish - Turkey | Tags: Juicy Turkey Burgers, Turkey Burgers, Turkey Burgers with Flavor | Permalink.